Nalbinding; getting started with the Oslo stitch. So you’ve decided to do some nalbinding. But where do you start? Many of the videos that I have found are excellent for demonstrating the actual stitches, but they have complicated descriptions of ways of making the starting loops. I found these videos quite confusing when I was starting, so I tried to find other ways to make that first stitch. Through trial and error, I found a way that suited me. This is what I do; I’m not saying that this is the only way, but it’s what I find easiest. First you need to cut a piece of yarn approximately 1m long (about two arm-lengths). You can use longer, but for a beginner using longer lengths can make the nalbinding more awkward. 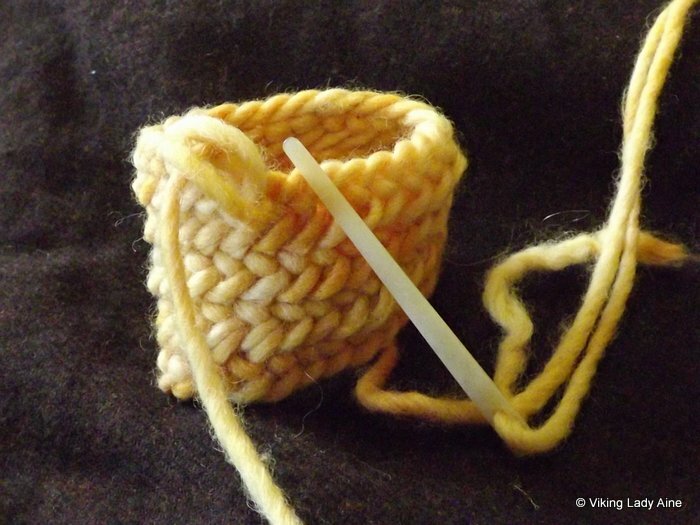 Thread the yarn through your needle, keeping the two ends at different length. 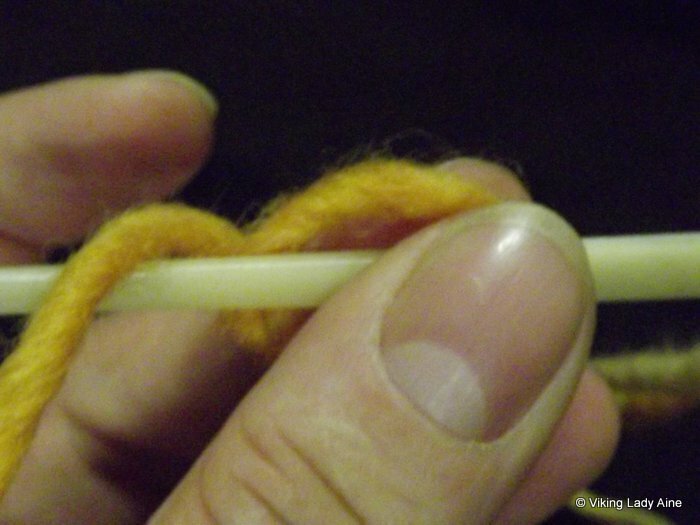 For description purposes, the working end is the end of the yarn that is attached to the needle, and the free end is the other. Put the needle down for a moment. 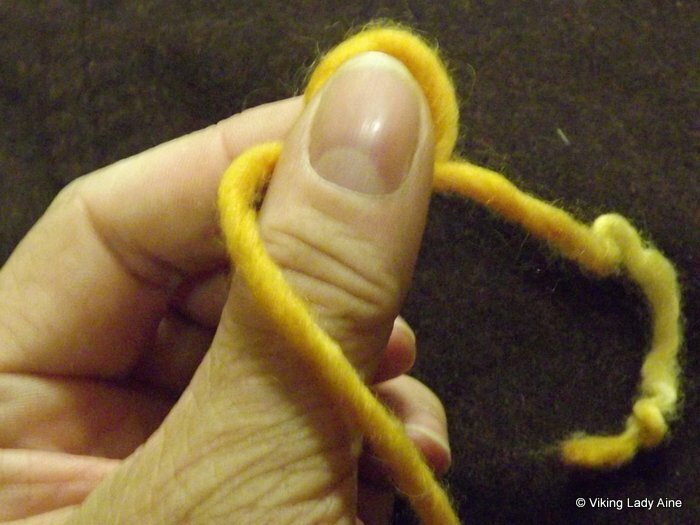 Make a loose knot in the yarn, and place the knot loop on the pad of your thumb. 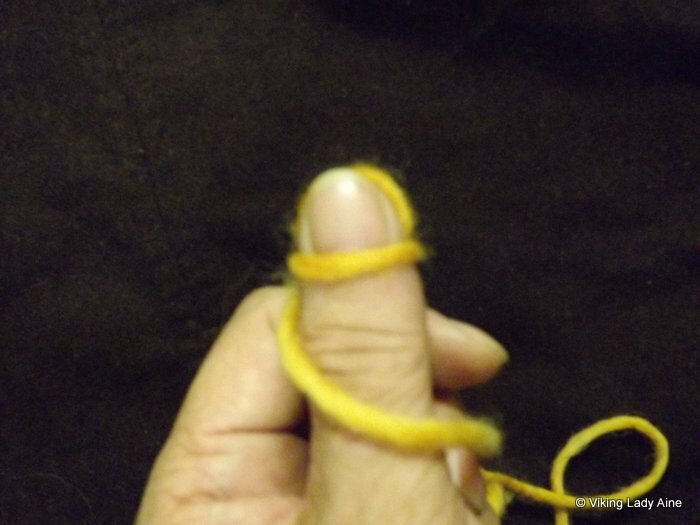 Take the knotted yarn loosely between your thumb and index finger, so the working end runs between the left thumb and forefinger, and lies across the thumb. NB the working end must run between your thumb and forefinger! The loop sitting up behind your thumb is what is referred to as the halo stitch. Now using your needle, pass the needle through the halo loop from the back towards you. 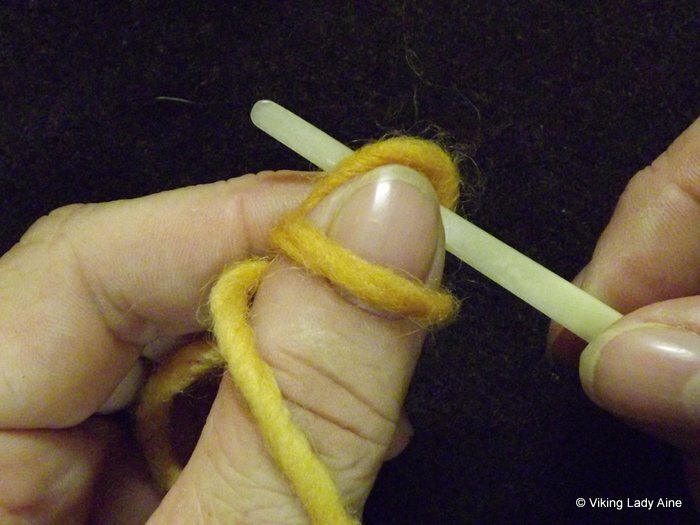 Then continue the needle under the working length of yarn lying between your thumb and index finger at the cross over point. This will work best if you come from the side of the loop instead of the top of it. The aim is to create another loop that runs across the front of your thumb. 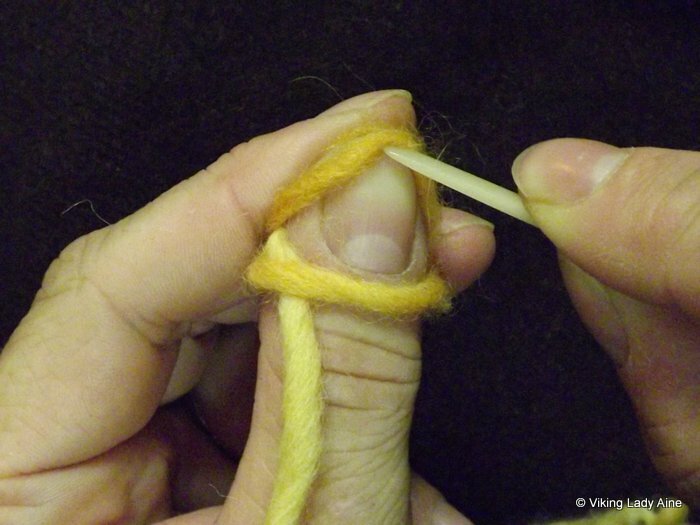 Pull the needle and yarn slowly through keeping a light hold on the stitches, until there is a loop around the front of your thumb. The loop around the front of your thumb is your working loop. You have now created a basic stitch to begin with. So far so good (I hope!). Now for the first Oslo stitch. Pass the needle through the halo away from you. Do not push the needle the whole way through the halo, but twist the needle round so the point passes back down under the working loop and the long piece of yarn at the cross over point. The easiest way to do this is on the pad at the back of your thumb. You can move your index finger slightly back out of the way until you have the needle in place. 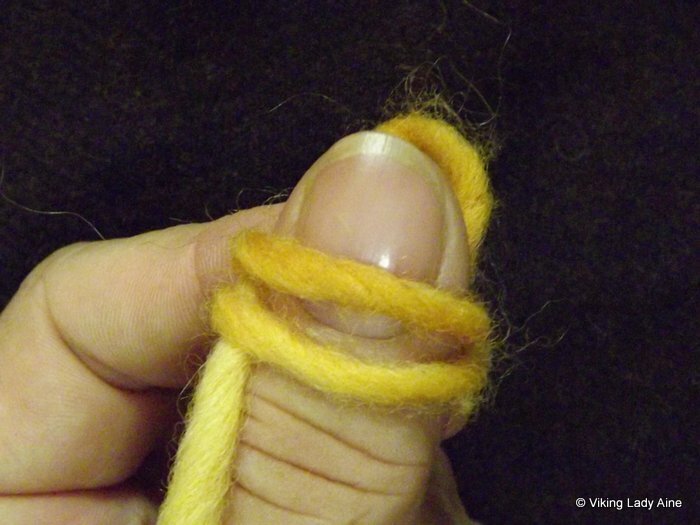 Then lightly hold the cross over point between your index finger and thumb, and pull your needle and yarn through. You will now have two loops on your thumb, with the newest loop closer to your nail bed. Push the older loop off the end of your thumb to create your new halo loop, keeping the newer loop on your thumb to create your new working loop. You now have two loops at the back of your thumb. If you are unsure of which is the halo and which is the working stitch, pull the working yarn and the working loop will tighten. Continue these steps in this section to create a chain, picking up each new halo away from you, and twisting the needle back down through the working loop and under the working end of the yarn. The chain length will depend on what you want to make. In my example I have done 25 stitches, but for a bag you will probably need more. You can make the chain as long as you need for the opening of the bag or hat. The chain can look ‘messy’ as you create it. 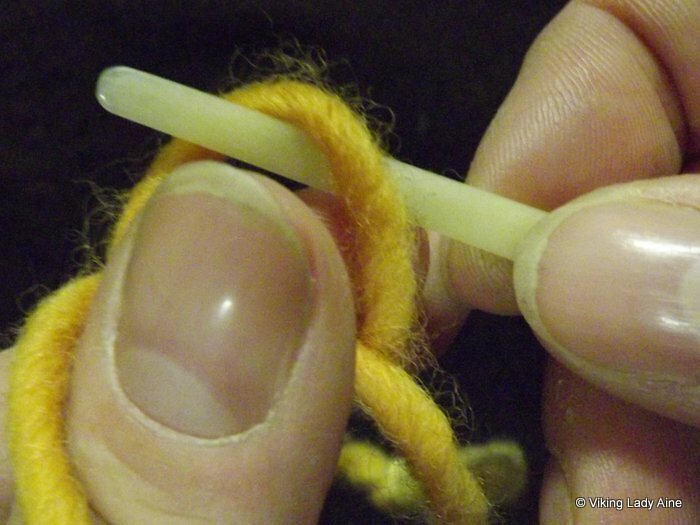 (To smooth it out, take both ends and pull gently and the stitches will even out. When you have the length of chain you need, you will have to join the ends in a circle. The chain should be straight and not twisted. Bring the free end of the chain round to meet the needle end. Pick the first stitch up by passing the needle away from you through it.Do not push the needle the whole way through. (This will be the connection stitch. As the connection stitch is picked up front-to-back the connection is termed F1). 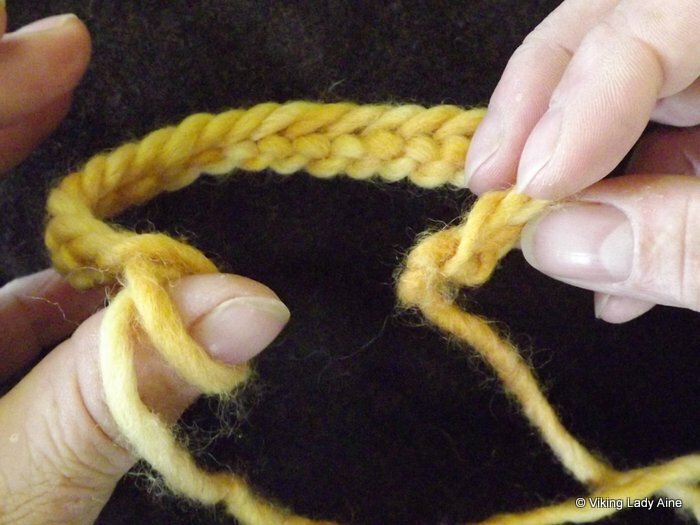 After you have picked up the connection stitch, make the Oslo stitch as described above; with the connection stitch on the needle, continue to pass the needle through the halo away from you, twist the needle back and down through the working stitch and the working end of the yarn as you did for the chain Oslo stitch. Continue by picking up the second stitch on the original chain and working a basic Oslo stitch. As you continue working, the nalbinded piece will work up into a tube. This is my basic method for starting hats,mittens and bags. So that’s my way of starting nalbinding with the Oslo stitch. If I want to use a stitch that requires more than one halo loop, then I just pick up more as I go along; first two stitches for Mammen, three for Broden and so on. I find that this also gives a graduated start to the piece as opposed to a block end effect. I use videos to help me learn the stitches. This link is to the best site I found for video instructions. Happy nalbinding! And remember – practice and perseverance. Posted on February 14, 2013 June 24, 2013 Categories Nalbinding, Wool CraftTags instructions, nalbind, nalbinding, Oslo stitch, Re- enactment, Start, Viking, Wool, wool-craft23 Comments on Nalbinding; getting started with the Oslo stitch. When I tell people that I nalbind, the most common response is ‘what?’. So I find I have to explain what is is, where it came from and even give a short demonstration of how it’s done. 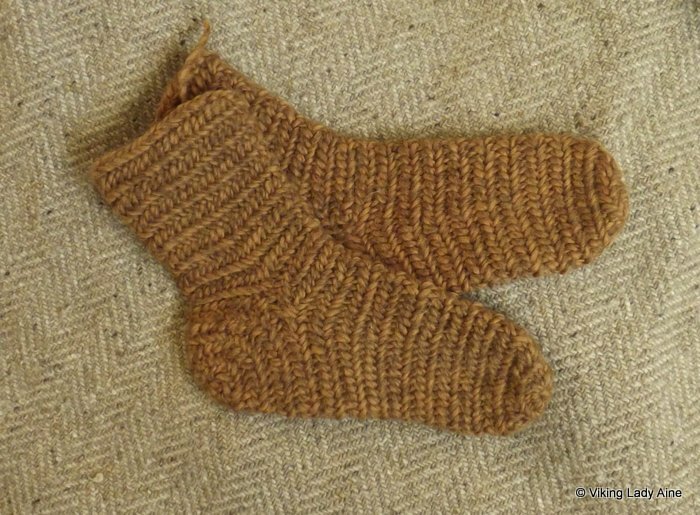 Basically, during the Viking-age (793-1066 AD) knitting and crochet were unknown, so they had to use another very old and effective method for making warm socks, mittens and hats: nalbinding. 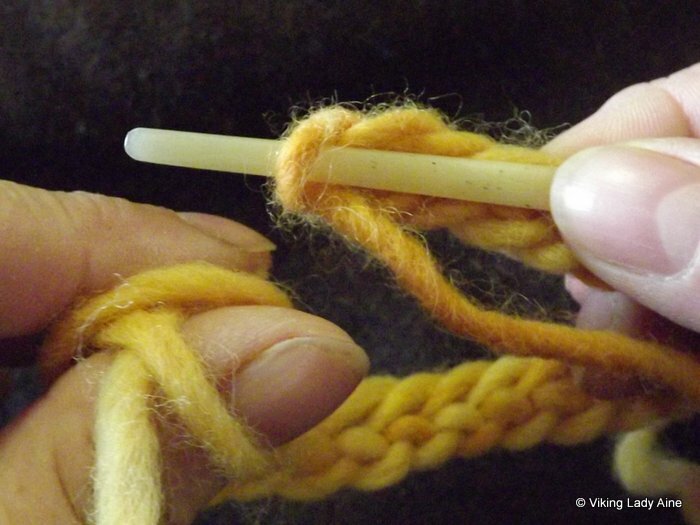 Nalbinding (also spelled nålbinding, naalbinding, nalebinding) is a method of creating a stretchy textile using short lengths of yarn and a single-eyed bone or wooden needle. Fabric is formed by looping and knotting the yarn through previously created loops, gradually building up row upon row of loops. 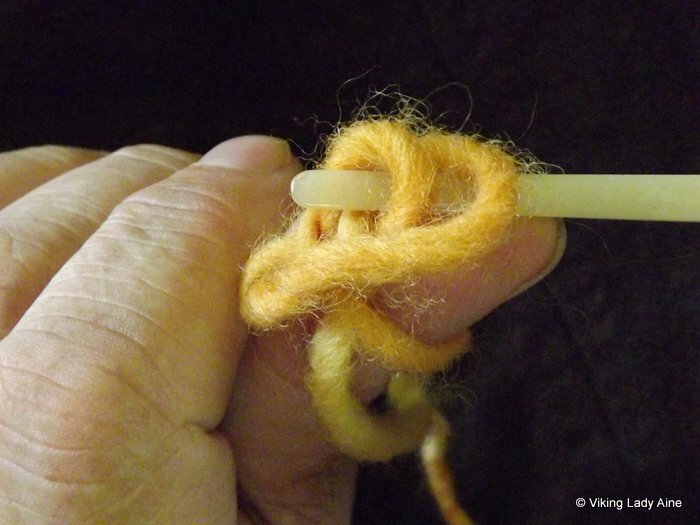 The gauge depends on the size of yarn and the looseness/tightness of the individual naalbinder. Depending on the stitch, the fabric will be soft, firm, stiff or stretchy. Nalbinding predates both knitting and crochet by at least 2000 years. Fragments found in Israel date to 6500 B.C. The oldest find in northern Europe is dated at 4200 B.C, and comes from Denmark. Additional samples of toed anklet socks from fifth and sixth century Egypt are also examples of nalbinding, previously misidentified as knitting. Nalbinding as a practical needle craft survived longest in Scandinavia before it was supplanted by easier to produce knitting. Nalbinding was regarded as a superior craft because it required more skill to produce and the fabric created was thicker and warmer. The name Nalbinding was introduced at the beginning of the 1970’s by Martha Broden and translates to mean ‘needle; to bind or sew’. 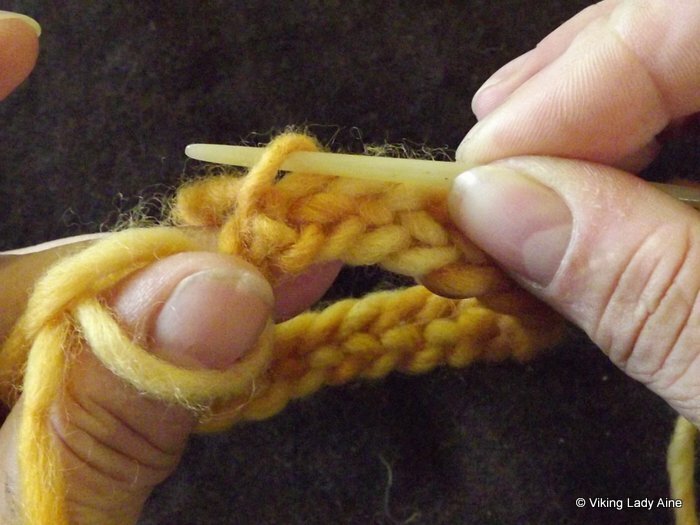 In knitting each loop is interlocked through the previous row and the previous stitch. 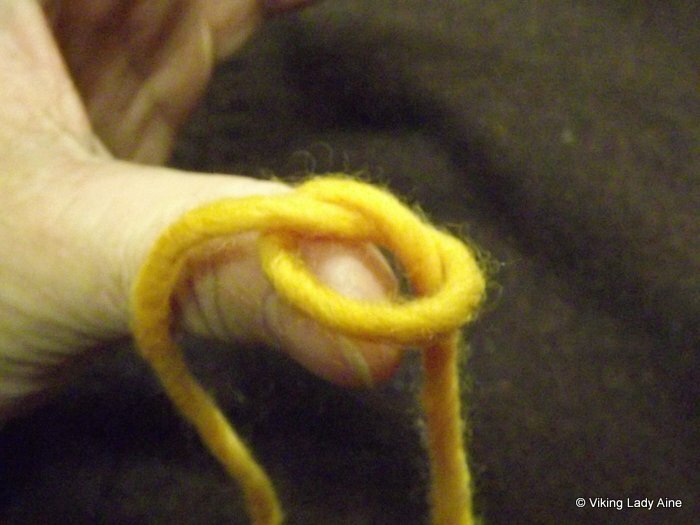 In Nalbinding, each individual loop is knotted in itself, and is also interlocked. 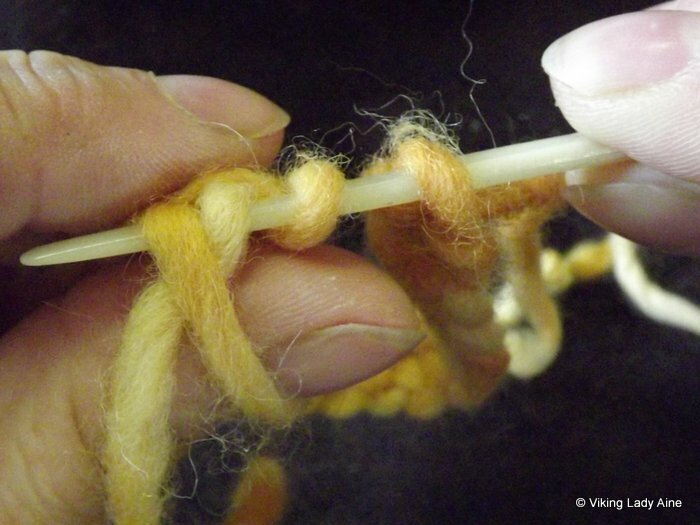 Each piece of yarn is pulled through completely and creates a knot. 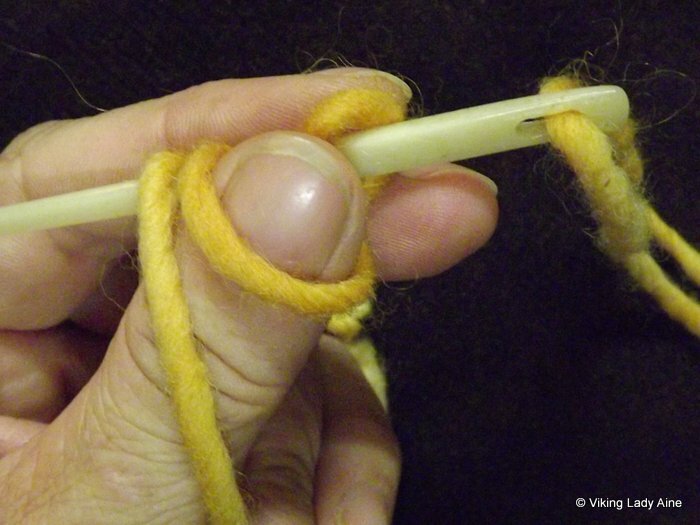 When you pull the end of a length of knitting, the piece can unravel completely; if you pull the end of a nalbinded piece, the yarn will knot! The nalbinded material will not ladder – socks develop less holes!! 2. The thumb chain method. I use the thumb chain method. This means that the working loops are fixed around your thumb, and working them will create a chain. Each Nalbinding stitch has a notation or classification depending on how the yarn is looped and worked. For example, the Oslo stitch has the classification UO/UOO F1. U means under, O means over, / denotes the point where a crossing point is. If you look at the yarn as it creates the stitch you should be able to see this pattern. However I find the classifications confusing for beginners and tend to stick to the stitch names. In Nalbinding, you work with lengths of yarn, and join them together as you proceed (unlike knitting or crochet where you work off the ball of wool). You also need to work with 100% wool so you can ‘felt’ the yarns together as needed. 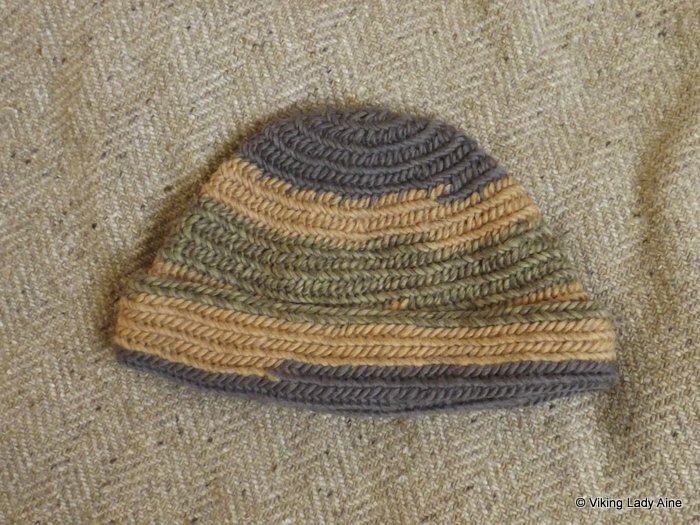 Ideally, beginners should use a thick unplied yarn as the worked stitch is easier to see. However, unless you spin your own yarn this can be difficult to find these days. Most people that have knitted or crocheted will pick up nalbinding quite quickly – but you don’t need previous wool-craft experience. And as with all things new; perseverance and practice will get you there! 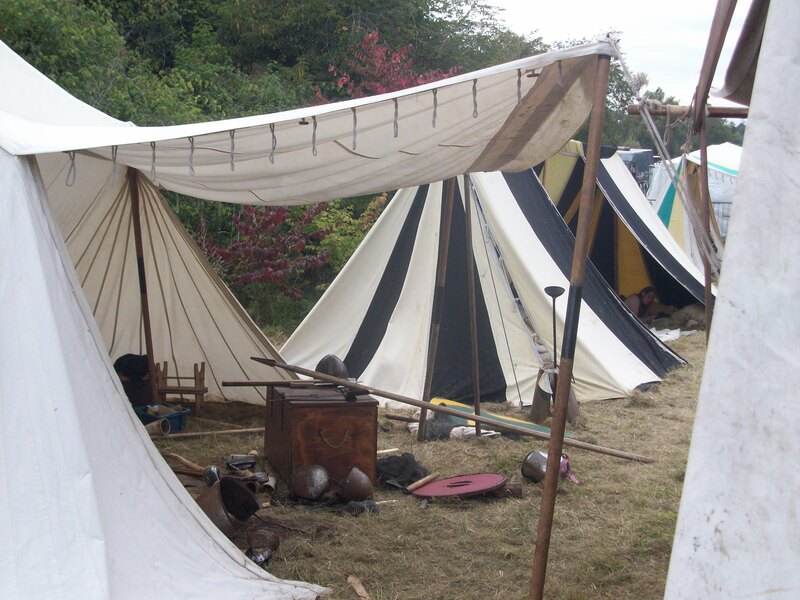 Thinking back to that day in Birr Castle, it’s hard to believe that viking crafts would become such a part of my life. Audhild taught me some of the basic stitches and left me to my own devices (the teaching part was complicated by the fact that she was left handed and I was right!!) I’d knitted when I was younger, but this was a whole new concept. Nalbinding is done with short lengths of wool that you felt together, and there is only one needle. And that needle looks like a darning needle!!! Posted on January 20, 2013 May 12, 2013 Categories Nalbinding, Wool CraftTags nalbinding, Re- enactment, Viking, Wool, wool-craftLeave a comment on What Aine did next…….